Personally, what I was most excited about concerning this book was the "hacked documents" format it was written in. Now that I've finally read the book, I can confidently say that the format is probably the best thing about the book, or at the very least, my favorite thing about it. It did take a little while to get used to the format of the book. At first, I felt like a kid in a candy store, but about halfway through, I thought I was tired of it. I started to think that the "found files" made it difficult to get to know the characters very well, and it started to feel like a repetition of emails, messages, and files. Much to my surprise, it turns out there were much more format-related delights ahead, including graphics, pictures, and even AIDAN's own thoughts (AIDAN is a form of artificial intelligence...basically a smart/mad computer). So yeah, the format? It was ridiculously awesome. Remember that mid-book crisis I was having about the format? That extended into the romance as well. I was super excited for the romance after reading the synopsis, which pretty much described it as boy breaks up with girl -> they fall in love again. I was excited. But then halfway through the book, my crisis of sorts had me freaking out. The fact that I was getting bored by the romance certainly didn't help. However, the further I read, the more quickly I realized that I was more invested in the romance than I thought. It's true that Kady and Ezra's romance was a bit unconventional since they were already in love and simply did not realize it, but even though that's not the type of romance I usually reach for, I was hooked. I don't know if it was the characters or how they interacted with each other - which was adorable, by the way - but somewhere along the way I fell in love with the both of them. I was particularly intrigued by how well the character development was written in this novel. In books, the character development is usually obvious in that you can actually see it happening while you're reading. Sure, in this book you see the romance developing, and you can view small, significant changes in the characters, but it's not really obvious, and you don't always think about it. In fact, I didn't even specifically think about the development in Kady and Ezra until a friend asked me to look at the first and last pages of the novel, and to specifically pay attention to Kady's voice. Lo and behold, the difference between Kady at the end and Kady at the beginning is kind of mind-blowing. She's so much more confident at the end, as if she's grew into her skin and finally knows her place. She's literally ready to take on the world (or space, I guess). What I love about this is by keeping the character development under the radar, the authors manage to portray the characters' changes as they would be noticed in real life: they're small changes that you don't notice from day to day, but there's a huge difference overall. I loved Ezra and Kady from the beginning, but I really liked who they became by the end of the novel. Okay, so I'm not going to lie, the plot was pretty epic. I'm not huge on science fiction so I wasn't sure whether this would be my thing, but what do you know, it was. The storyline and feel of the book reminded me of Amie Kaufman's These Broken Stars, but the way Illuminae went on about everything made it original from pretty much every other book in existence. There were so many twists and turns presented wonderfully in the "found footage" style of writing, and if anything, that only made this book that much more exciting. 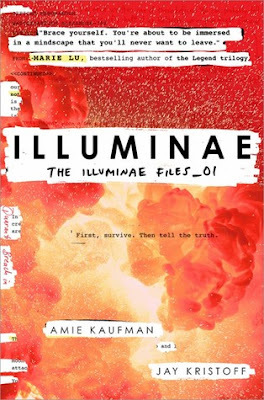 I'm probably the black sheep when I say that a book about an interstellar war didn't really sound up my alley, but once I began reading and read through the sheer quantity of exhilarating elements combined to make Illuminae, there was nothing that could have kept me from the novel. AIDAN was by far my favorite part of the novel, even more than the romance (a first, I know). He was the most freakish yet amazing thing to happen to this book! When we first meet him, to say he scared me would be an understatement. He believed he was doing the right thing, that killing thousands of people was an okay thing to do - "mad computer" does not do AIDAN justice. It took me a long time to get used to him, but by the end of the book, I was so on board. In fact, I'd even use the word adorable to describe him now that I've read the book. AIDAN's development - I know he's artificial intelligence, but trust me, he grew - was a beautiful, unnatural thing to see, and thinking back on his part of the story, I want to cry happy tears. He's my favorite creepo ever. Of course, the brilliant combination of Amie Kaufman and Jay Kristoff means that we readers are stuck with amazing authors who aren't afraid to kill off characters. Lots of characters. The death count. never. ends. Book Synopsis: This morning, Kady thought breaking up with Ezra was the hardest thing she’d have to do. Source: A copy was received from the publisher for review.